Hello Owners! Jon here. I teach small business owners like you and like me to do the stuff I told myself to work and that’s why because it works and it uses modern marketing techniques, so most of it is free. Isn’t that wonderful? How could it possibly be free? Why would you do this, Jon? That’s the subject for another podcast. Let’s talk about being complacent. I don’t need to describe, to explain what I mean by complacent, do I? There are many of you that are doing the same thing over and over. I believe it was wonderful Mr. Einstein who said the definition of insanity is doing the same thing over and over again expecting a different result. Answer this. Are your profits growing? Are your customers great? Do you have some bad ones? Are new customers and new leads coming to your door every day or every week? Do you have more customers than you can shake a stick at and you are not quite sure what to do with them? Do you have some customers you’d like to offload, possibly to advice to go to your competitor so they can deal with all the problems and issues they cause or the lack of profits that they cause? Did you answer yes to any of those? Because that would be most of us. And, I think even myself, I would answer yes to those questions because these doesn’t stop. It’s not something I started a couple of years ago and finished last week. This is ongoing because I’m not complacent. Now, I know people who have businesses. For instance, I know somebody who uses advertising as a model and Freddie tells me that advertising is no longer a great model for a business but continues to rely on a wrinkle to come from advertising. Now, that to me suggests something needs to change. I also know somebody who has, who, their customers, they give out service, the service that their customers ask for, but they know because they tell me that that is not the service that the customers should be asking for, not the service the customers should be receiving because they know the better thing. But, it’s just easy to sit in their comfort zone and just let the customers get what they want. The fact that the customer doesn’t know what they should be wanting seems, “Hah.” Personally, I don’t think that’s the way to do it. I think to be brave and grow because while you are not, while you are sitting back on your levels doing the same thing that you have done for the last 5 years or 10 years, some of us be older, maybe 20, maybe 30. Oh, gosh. Did you know I started in 1994? Ohh Yes. I know some of you weren’t even born. If you are sitting back doing the same thing, you are not going to get on for long. Even huge businesses disappear suddenly. In UK, Woolworths went bankrupt and disappeared in about 3 years — they were done. We have Tescos, like a Walmart, but they have had all kinds of issues. We got cheap ones that like attacking them and bringing in a new approach to supermarkets. We’ve got tire suppliers. They are being attacked by online companies who come to you and put the things on your driveway more than you having to go to the tire place center. So, get and puff your posterior and start to make some changes. Please, I beg you, please. Please. I don’t want you come back to me in a couple of years and saying, “Oh, Jon, you know, the funny thing is you did one of that complacent scene and look what happened to me.” Yeah, just do it. Yesterday, I talked about autoresponders and sometimes the change and everything is overwhelming. I said, you want to write autoresponders forever so you got a series that last for a year, and that maybe 50 or 60 e-mails you got to write. Now, if I said to you, “Okay. Here is a change. Go write 50, 60 e-mails.” You’re gonna think, “You’ve got to be kidding. When am I gonna do that?” However, I did explain one at a time, one at a time. You don’t even have to write one a day. One a week. What’s that? 20 minutes. Come on. You can do this owners. You can, I know. Let’s make changes. Let’s get modern. Let’s grow our businesses together. How about it? Yeah. Good answer. Instead of hearing me running and talking about complacent people, why not sit back, take a break, grab a coffee and read an online magazine? Today we are talking about Anita Campbell. 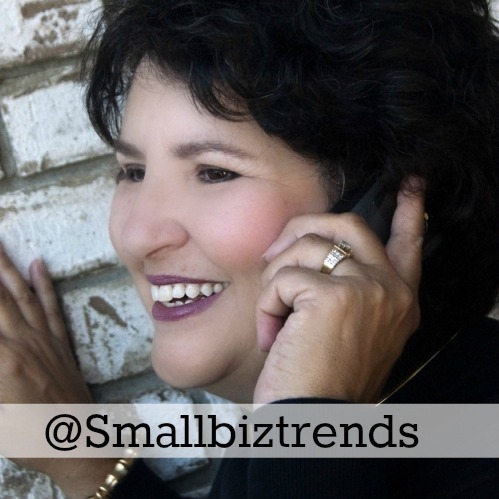 Anita has a great business that’s called Small Biz Trends. So her Twitter handle is @smallbiztrends. I think her website is actually smallbiztrends.com. And, she has another one called Biz Sugar, another handle she calls @BizSugar. But, go there, she has been publishing that is an online magazine since 2003 I think. It is chock-full of information for small business owners getting groups, refuses things that includes gear guides. It’s, you know, gadgets, things like that. It’s pretty cool. Now, she is also a very, very strong advocate for female entrepreneurs. It is a force, right force and it’s a top female entrepreneur. So, ladies, learn a lot from men. But men, too, learn a lot from women. They are so much better at this stuff than us. Trust me. Now, for you, your last assignment of the day is to review this podcast. I’d love to know. There are many reviews on iTunes. I like it and I like to hear them from all over the world. So, go to iTunes. Give a review. Give your honest opinion. I’d love to hear what you think. What have you become complacent about?